Moscow, September 8, Interfax - Delegation of the Sendai Diocese of the Japanese Autonomous Orthodox Church will visit the Primorye Territory on the occasion of the 45th anniversary of St. Nicholas of Japan canonization. “As expected, a delegation headed by Archbishop Seraphim of Senday will visit Primorye from September 10 to September 15, and bring particles of St. Nicholas relics for churches,” the Vladivostok Diocese told Interfax-Religion on Tuesday. Exhibition The Christian in the country of samurais dedicated to St. Nicholas of Japan will open in Vladivostok on Friday. The exposition prepared by the Metropolia and the Primorye State Museum will tell about St. Nicholas’ life and work and establishing of Orthodoxy in Japan. The Japanese delegation will visit the ceremony of opening the exhibition. 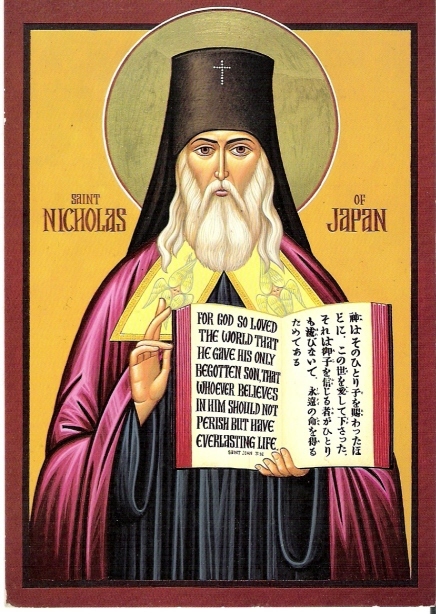 The Japanese Autonomous Church was founded by St. Nikolay (Kasatkin) who came to Japan from Russia on 1861 on the decision of the Holy Synod. He founded and headed the Russian Orthodox mission in Japan in 1870. He translated the Holy Scripture and liturgical books into Japanese and built the Resurrection Cathedral in Tokyo. The Russian Orthodox Church canonized Archbishop Nikolay in 1970. The Moscow Patriarchate granted autonomy to the Japanese Orthodox Church the same year.